In the particular episode being referenced here, George realizes that every decision he has made, consistently has worked out badly for him. He comes to the conclusion that all of his tricks and schemes that he has been so invested in have repeatedly ended up failing him in the end. George finally realizes that since his instincts have lead him in the wrong direction time and time again, the only solution is to just do the exact opposite of what he would normally choose to do. That simple realization of the need to go directly against his own instincts essentially is what the Costanza Principle is all about. 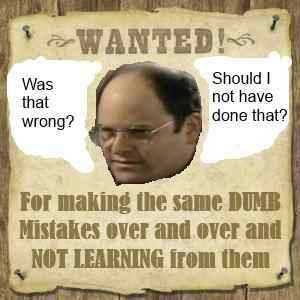 The episode goes on to show a lot of funny events that follow George’s decision to do the opposite of what he would have normally done in a variety of situations. For example, by doing the opposite, he meets a girl that is way out of his league and then gets a job he never would have otherwise gotten (working for the NY Yankees!) if had he followed his old course and his former mode of decision making. 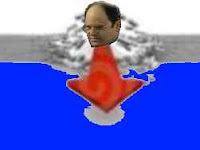 So how can we learn from the Costanza principle? Hopefully no one reading this has a life so chaotic that all of their decisions are the wrong ones like our friend George. Still, just about everyone can think of an area in life where we may have struggled by making the same mistake over and over again. Perhaps it is with relationships, repeatedly getting involved with people that seem nice at first but end up having the same negative personality traits over time. Maybe there are other avoidable arguments, dilemmas or other predicaments that we repeatedly seem to get ourselves into whenever we follow our own faulty instincts in one type of area where we seem be vulnerable to poor judgment for one reason or another. When you find yourself saying ‘I just can’t believe I did that again!” Or maybe you want figuratively bang your head into a wall out of frustration because of making the same mistake you should have seen coming yet again. In these types of situations, perhaps it’s time to try “the Costanza Principle” in your life. Perhaps it’s simply that time to do the exact opposite of what you normally would have done and then see what happens next.